) language is the systematization of expression. Symbols are islands of relative certainty in a sea of meaning  although determinate in shape and extent themselves, their coastlines are infinite (to evoke a Chaos Theory image). They are the hard currency of thought.
) There is good reason to distinguish between real codes or languages  systems of signs standing for conceptual realities other than themselves, where both the signs and those realities are experientially accessible to the user  and other uses of the word code or language where that is not the case. Thus the genetic code (where DNA strands do not stand for any particular external reality but issue rather very indirect instructions for its construction) and any purportedly universal brain code inaccessible to its users fall outside this definition. 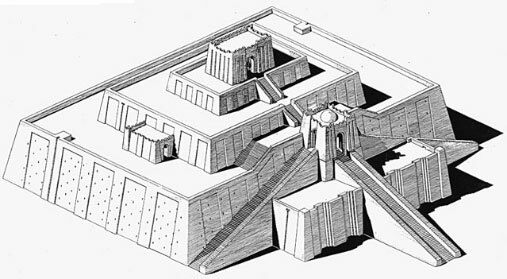 The ziggurat of Ur-Nammu (Woolley 1939). Publication: Publications of the Joint Expedition of the British Museum and of the University Museum, Unitersity of Pennsylvania, Philadelphia, to Mesopotamia. The Myth of the Confusion of language suggests that there was once a universal language spoken by all human beings. The biblical story reminds of the unity with nature and the carefree innocence Adam and Eve had in the Garden of Eden before they were expelled. By eating the forbidden apple they receive consciousness, but also have to face the hard materiality of life outside the paradise. The building of the Tower of Babel shows God how powerful his creation is. God analyzes that humanity has this power through the unity of language, and decides to destroy this unity. Through the Confusion of language humans have gained cultural diversity, language individuality, multiple dimensions of mental reality, but ever since then humanity has lost the almost divine power it used to possess. Many myths can be understood as a metaphorical expression of the social subconscious (C. G. Jungs Archetypes): the Christian myth of the Tower of Babel makes clear how much the human psyche perceives the language differences as a curse and an unnatural state. But one can argue that the confusion of language was in fact a benefit. A universal language without cultural diversity would actually stunt the evolution of unique ideas, because everyone would have a similar framework in which they thought. Hildegard von Bingen  Litterae ignotae (Unknown Writing) and Lingua Ignota (Unknown Language). Often referred to as one of the most significant women of her times, Hildegard von Bingen was a visionary, poet, composer, naturalist, healer, and theologian. According to the legend she received the order from God to write down everything she heard and saw. It is dated to ~ 1150 that Hildegard wrote the lingua ignota. Believers propagate that this mysterious language contains the divine plan for the construction of the world, and therefore its decodation would lead to a completely new conception of the world. Whether Hildegard encouraged her nuns to speak this rather limited language with its Germanic-sounding vocabulary and Latinate syntax so as to communicate in secret, as some have suggested, has not been determined. The passing of secret messages might have been more feasible if they had used the litterae ignotae, Hildegard's alternative alphabet. Due to the fact that there exist only one complete and two partial editions of the Lingua Ignota, of which especially the complete one (by Roth, 1880) is difficult to get hold of, much mystery has been created about Hildegards constructed language. Believers propagate that this mysterious language contains the divine plan for the construction of the world, and therefore the decoding would lead to a completely new conception of the world. Some philosophers of the 17th century, among them Bishop Wilkins, George Dalgarno, René Descartes, and Gottfried Wilhelm Leibniz, proposed the construction of a philosophical language that would consist of a system of communication based on classification according to logic rather than on human speech. To overcome the limitations of natural language, there have been numerous attempts at designing a universal language. In western thought, this project has a long tradition. 3. as a logical calculus, providing a powerful instrument of the human mind for the demonstration of contradictions and the discovery of new truths. (2) A fourth goal, popular in the Middle Ages, was the reconstruction of The language of Adam. For an overview see Eco 1997. (3) J. Cohen 1954, p. 50. See also Mittelstrass 1970, pp. 43545. According to Maat 1999, Leibnitz did something about the project, he just did not complete it. Descartes's statements on literature as such are rare and always subordinate to his philosophical concerns. His quest for a language that would convey philosophical ideas and propositions as unambiguously as mathematics is consistent with his distrust of literary language and rhetoric. He saw as detrimental and ultimately debilitating literature's capacity for creating the illusion of reality and truth. John Wilkins, Bishop of Chester was a founding member of the Royal Society and one of the most influential thinkers of the seventeenth century. His masterpiece, An Essay Towards a Real Character and A Philosophical Language, is a key text in the history of language. Ready for publication in Januar1666 but destroyed by the Great Fire, the work finally published in 1668 is Wilkinss attempt at creating a universal language. Wilkins maintained that because all peoples minds functioned in the same way and had a similar apprehension of things, it should be possible to cultivate a rational universal language and a character that would also articulate things and notions. Although Wilkinss universal language was never adopted for common use (and he never regarded the work as complete), it was widely considered to be superior to the earlier work by George Dalgarno, Ars signorum (1661). Some of the greatest minds of the eighteenth century received Wilkinss creation enthusiastically: John Locke recommended the Essay over Dalgarnos work; Newton mentioned the book in his correspondence; Erasmus Darwin admired it; and the anthropologist Lord Monboddo praised it in his Origin and Progress of Language. John Wilkins An Essay Towards a Real Character and A Philosophical Language consists of his research and invention of a shorthand system  the real character, which is considered remarkably advanced for its time, and his effort to create a philosophical language that would establish a one-to-one correspondence between words and objects. It would thus be impossible to refer to non-existent things (since there would be no words to describe them); impossible (at least without repeating oneself word for word) to make tautologous statements. Language would at last resemble that clear sheet of glass between human minds and external reality undistorting, invisible and indivisible from thought. Leibniz took a great interest in developing a mathematical model of language. His dissertation The Arte Combinatoria, written when he was 20 years old, already showed this. Leibniz proposed a Characteristica Universalis, which, like many projects of his day, was a proposal for the creation of a universal language. Leibniz' Characteristica Universalis differed from the other projects, in that it proposed representing the parts of the language as numbers, so that one only had to add up the numbers to determine meaning. Leibniz also did not agree with the idea that the meanings of words are completely arbitrary. He felt that in older languages there was always a connection between the word and the object it represented, and that although some changes may occur in languages over time, the link between word and object still remained. Volapük (vol=world, pük=speech) was the first synthetic language to reach the point of large international popularity. Its inventor, the German Monsignor Johann Martin Schleyer, worked out a grammar, which was absolutely regular, and a vocabulary derived from English, German and Latin. About 30 periodicals were published in Volapük, and approx. 300 clubs in different countries were devoted to its study. In 1889 the third and last Volapük congress took place in Paris. A quarrel between Johann Martin Schleyer and Auguste Kerckhoffs, President of the Valapük Academy, as well as the emergence of Esperanto led to a quick downfall of Volapük after 1889. Inspired by the simple English grammar, Polish Dr. Ludwik Lazar Zamenhof invented the Interlanguage Esperanto in 1887. The name Esperanto at first was Zamenhofs pseudonym (An Attempt at an International Language, by Dr. Esperanto). Esperanto is a constructed language based on the elements of several European tongues, and has a strict, yet not primitive grammar. The first Esperanto congress took place in Boulongne-sur-Mer in 1905. Esperanto has been on the decline since its heyday just after World War I when there was hope it might one day become the official world language. English has since become the generally accepted world language, but Esperanto has not died out. Today, according to the World Almanac, there are over a million speakers of this language throughout the planet. The Universal Esperanto Association, whose office is in the Netherlands, maintains a volunteer network of Delegates in over 70 countries with specialties in tourism, computers, jurisprudence, educational instruction, among many others, in order to promote contact among Esperantists with special interests. The UEA also promotes Esperanto through its consulting relationship with UNESCO and its yearly World Congress, held in a different country every year. Other constructed languages followed, which could however not fasten to the success of Esperanto. Some examples: Ido (a reformed Esperanto), Interlingua, Interglossa and Basic English. AUi seems to be one of the most straightforward attempts to create a language in which the words directly refer to the essence of things. This language served the inventor Dr. John W. Weilgart as a successful tool in psychotherapy. The therapeutic value of aUI lies within its simplicity. The user of this language is forced to express thoughts and feelings in a direct and very distinguished way. As an example, the English word love is translated in aUI as brO (together- good-feeling or together-joy), a letter is a send-thoughts and a photograph is a light-picture. The Language of Space is the cosmic communication, whose elements can be learned in an hour. It is the primeval language of the Logos of pure reason that takes our human race back before the confusion of Tongues at the Tower of Babel. (p. VI, Language of Space by Dr. John W. Weilgart, Cosmic Communication Company, Decorah, Iowa, 1962)In aUI, the speaker is forced to say exactly what he means and all the circumlocutions required by our taboos and prejudices are eliminated. To use it is to understand reality and learn to think. the modifier precedes  so it is the essence of a word that lingers on in our memory, even if we missed the first sounds. The hearer catches the substance in a nut-shell. Leibniz proposed a language to consist of categories. aUI contains Ursprache categories like Jungs collective subconscious of creativity. As the symbols (Ur-Gebärden, arche-gestures) are based on associations of meaning, the Language of Space is meaningful throughout, and thus quickly learnable even for people with little mechanic word-memory. There are certain signs and gestures which are quite obviously instinctive bodily movements. The idea of a World Language has occurred to many people: linguists, statesmen, idealists and practical businessmen. It is, however, a melancholy thought that none of our sophisticated spoken languages seems to qualify for the promotion of mutual understanding. Less spectacular, but perhaps of greater significance is an observation which has been recorded many times: that natives from the remotest parts of the world, from Hawaii, Africa and South America, had no difficulty in conversing with the deaf and dumb people in England. The study of sign language systems and cultural meanings of body signs by T. Brun make it clear that there are very few or maybe even no signs that transport the exact same meaning for every person in the world. Cultural variances of even the simplest gestures do not inhibit humans from communicating in sign language, but make a strict classification impossible. Jean-François Sudre (1787-1864) invented Solresol in 1817. His "Langue Musicale Universelle" is considered the first music-based Interlanguage. ]. The grammar of Solresol, as one might expect, is quite complicated. The plan, first conceived in 1817, was presented the Academy of Fine Arts in 1827, and gained wide acceptance, being sponsored by such figures as Victor Hugo, Lamartine, Humboldt, and Napoleon III. Sudre died in 1862, but his language continued to find followers, such as Gajewski, who published a book about it as late as 1902. Even on the eve of the First World War, despite the Volapük and Esperanto that had had appeared in the intervening years, devotees of Solresol continued to air their views. Eaiea, created by Bruce Koestner in 1990, is a similar approach to a musical language. It is designed to allow musical instruments the opportunity to speak words through combinations of pitches, and also to let singers speak two languages simultaneously. Amongst the numerous constructed languages  fictional languages, international auxiliary languages, logical, philosophical and personal languages (see http://www.langmaker.com/db/mdl_index_languagetype.htm) Heinzmanns phonetic picture-writing is an especially interesting creation. Lautbildschrift invented by Leonhard Heinzmann in 1998. The combination of sound and picture: the ideograms are formed by specially designed (few and simple) letters, so that each ideogram can be read phonetically -it's a picture writing and also a true phonetic writing! Artificial languages usually share the same disadvantages: the difficulty of learning it and the lack of a core of native speakers or of an established literature. Furthermore the issue is the method by which the international language is to be achieved.